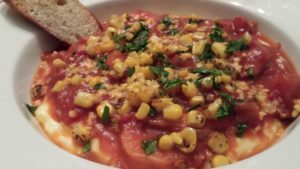 Smoky Shrimp over Polenta. 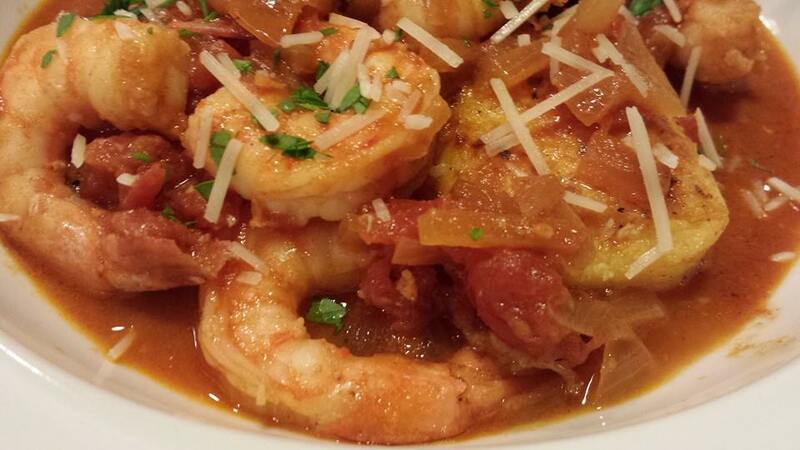 Sweet and succulent shrimp are draped in a smoky tomato sauce and served over sauteed polenta slices. This is one of my absolute favorite seafood dishes. It’s rich and satisfying. 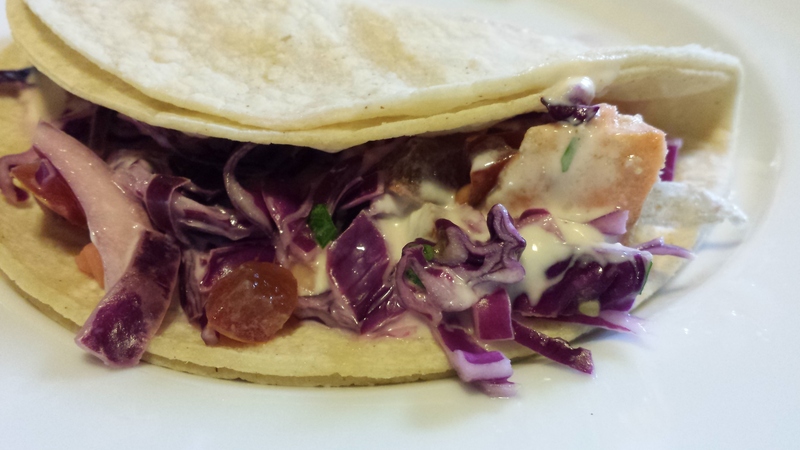 My husband loves this dish, and I do, too. I should make it more often. Although I live within close proximity to the Chesapeake Bay area, home of the famous Old Bay Seasoning , I have never been a huge fan of shrimp. The shrimp that I purchase in local grocery stores always tastes soapy and weird. 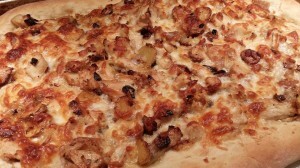 Most restaurants generally serve overcooked shrimp or totally ruin the shrimp by deep-frying it in tasteless batters. That’s at least until Whole Foods Market came into my area. 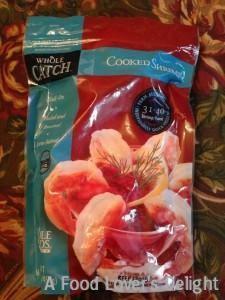 Now, I purchase their very tasty cooked shelled deveined frozen shrimp in bulk. And yes, some days, I will purchase raw shrimp and prepare it. Who doesn’t like a time saver though? For this quick dish, which is both summery and wintery at the same time, I start out by making a spicy tomato sauce. Saute some onions and garlic, and then add tomato sauce and diced tomatoes. A little red or white wine adds to the flavor. Seafood stock adds richness. And for the smoky flavor, I use smoked paprika . Polenta serves as the base for the smoky shrimp. 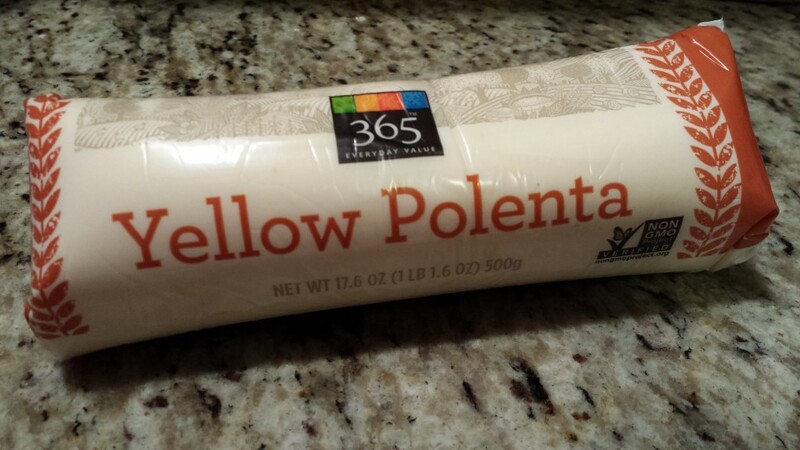 You can either use creamy polenta, or buy a log of prepared polenta to cut into round slices. I prefer the denser polenta slices to the creamy version. 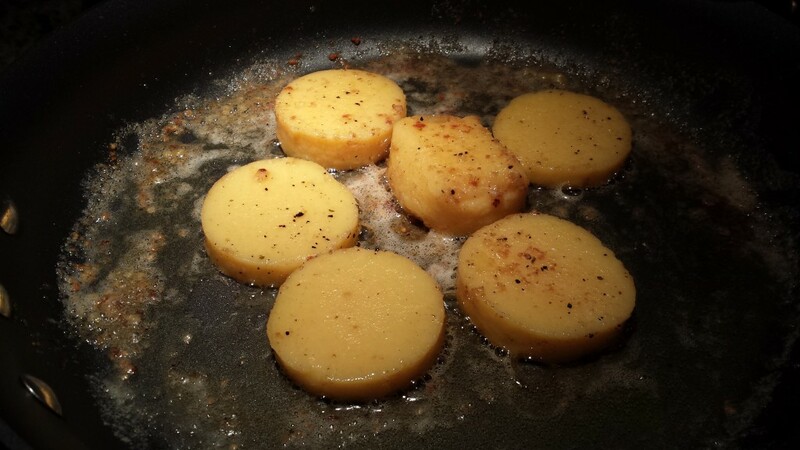 I like to saute the polenta slices in some garlicky butter until they are golden brown. 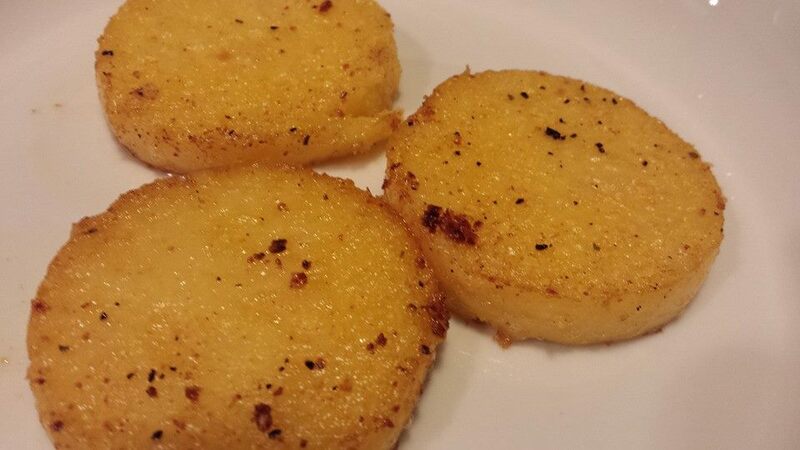 The polenta slices will become crispy on the outside and creamy on the inside. While the polenta slices are sauteing, simmer the smoky tomato sauce. 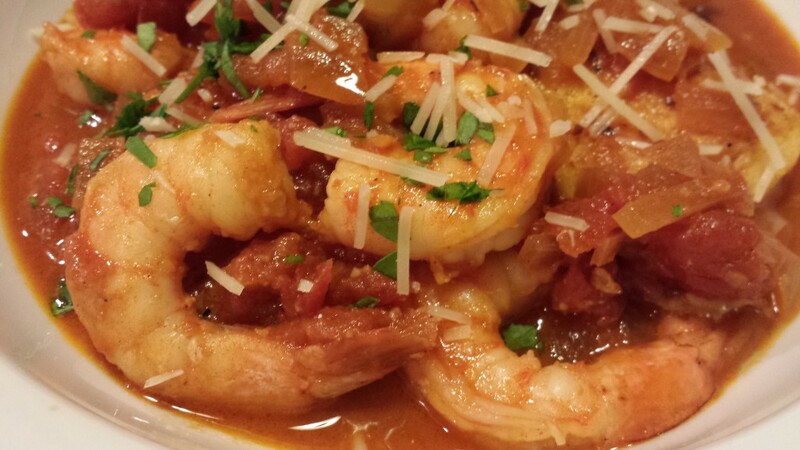 Just when ready to serve, warm the shrimp in the smoky tomato sauce. Do not overcook the shrimp or they will become tough. Divide the sauteed browned polenta slices amongst the serving bowls. Top the polenta with the shrimp and smoky tomato sauce. Sprinkle with some shredded parmesan and finely chopped fresh parsley. 1. In a chef’s pan over medium low heat, warm the olive oil. 2. Saute the diced onion in the olive oil until translucent. 3. Add the 2 cloves of minced garlic and stir. Let cook a minute or so. 4. Add the red or white wine and simmer a minute. 5. Add the diced tomatoes, tomato sauce, seafood stock, smoked paprika, and salt. 6. 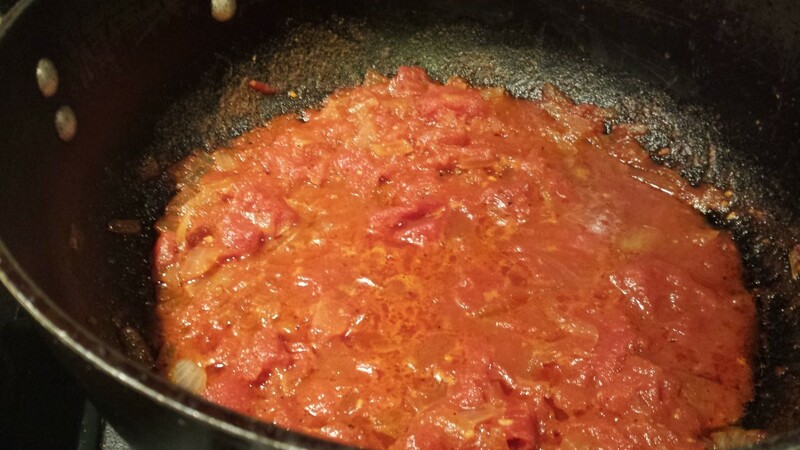 Lower the heat and simmer the smoky spicy tomato sauce for about 10 minutes. 7. Meanwhile, sprinkle some smoked paprika on the shrimp and toss them. Set aside. 8. If you are using the sliced polenta, warm the butter and the final minced garlic clove in a nonstick skillet or grill pan over medium heat. 9. Add the polenta slices and saute/grill until they are brown on one side. Turn them over and brown the other side. If you are using the creamy polenta, then prepare it according to the package directions. Keep warm until serving. 10. 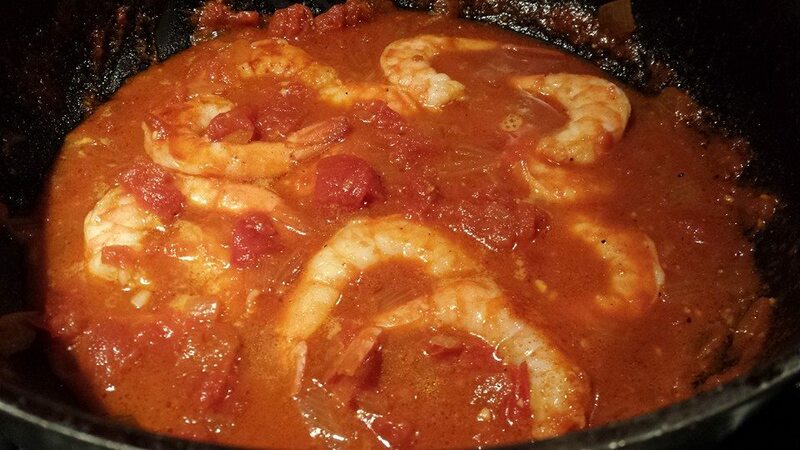 When you are almost ready to serve, add the shrimp to the smoky tomato sauce. If the shrimp are still frozen, cook them in the sauce for 4 minutes. If the shrimp are completely thawed, just warm them in the sauce for a minute or two. Shrimp can overcook and get tough very quickly and will curl up when too done. 11. To plate, arrange three polenta slices in a serving bowl per diner or divide the creamy polenta amongst the serving bowls. 12. Ladle the sauce over the polenta slices in each serving bowl. 13. Divide the shrimp amongst the four serving bowls, 6 shrimp per bowl. 14. Divide the shredded parmesan amongst the four bowls. 15. Sprinkle with the chopped parsley and serve immediately! Serves 4 as a main course. Offer with a Caesar Salad and some garlic toast. Variations: Instead of the shrimp, you could use one-inch chunks of your favorite meaty fish such as halibut, tuna, or salmon. Add a dash of red pepper flakes along with the smoked paprika for additional heat. If you are using the creamy polenta, stir in some shredded parmesan or sharp cheddar cheese for extra decadence. Heat some roasted corn in a separate pan and serve over top of the dish. To lighten this dish, omit the butter and use olive oil. 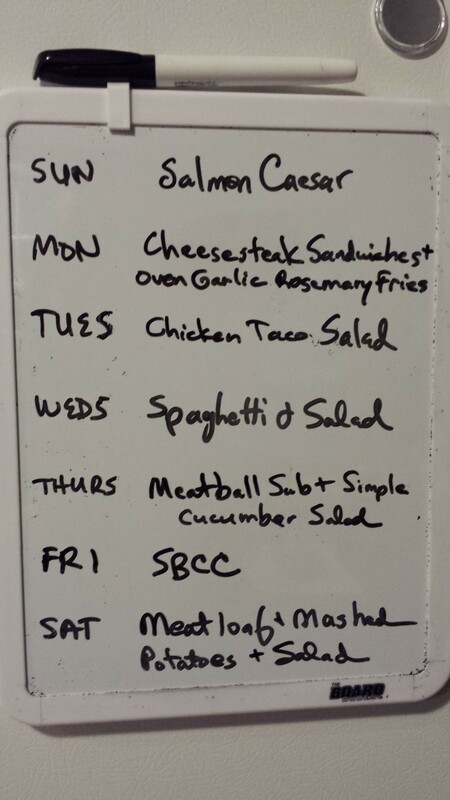 Also, omit the shredded parmesan. You could serve the shrimp and smoky tomato sauce over basmati rice or linguine if you prefer.